Usually for my Thursday’s Featured Book blog post, I highlight a novel written by a single author. All of the authors I highlight on Thursdays are living, unlike Monday’s Western Review when I blog about Western books and movies, new and old. It’s my way of trying to shed a little light on some of the writers who are keeping Western novels alive. This week’s blog is a little different. It’s an anthology, which I’ve grown to love. They’re a great way to be introduced to new writers. Some are good, some not so much, but either way you can learn a lot in a short read. This particular anthology, “Guide My Hand, Precious Lord,” had eight stories by eight different authors. Full disclosure: One of the stories, “Crisis of Faith,” is mine. What makes this a bit different than other anthologies, and maybe even unique, is that it is Bible-based, with each of the stories striving to be inspirational and spiritual. And they are. “We hope you will be encouraged, challenged, inspired, and renewed as you read these short stories of people of the Old West who relied on God through the thick and thin of life and found Him faithful. It’s a fun read, and besides stories from Jim and myself, you will find some from other well-known Western authors, including Douglas R. Cobb, Robert Andrews, G.P. Hutchinson, Fred Staff, Michael Haden, and a newcomer to the Western world, Arlo Flynn. I have had the pleasure of sharing pages with some of these gentlemen in previous works, but this one is different. I hope you give it a try, and I’d love to hear your feedback. 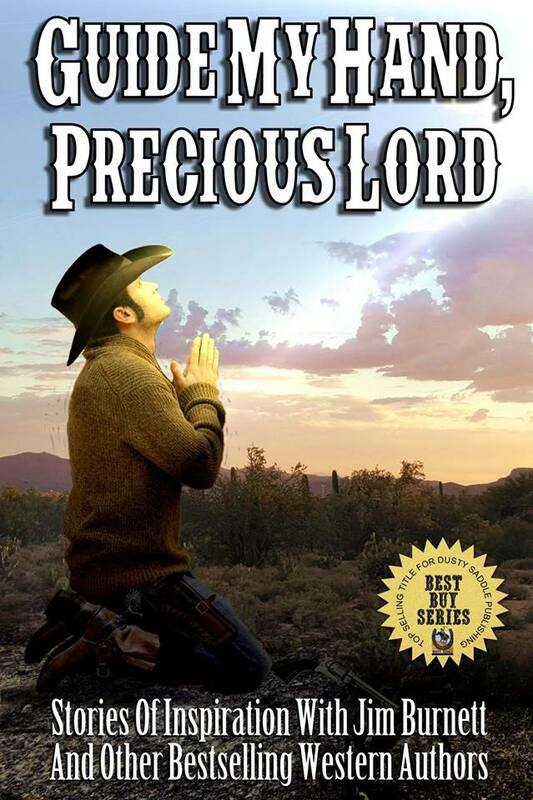 Dusty Saddle Publishing and I are excited to share with you the first dedicated inspirational Western collection, “Guide My Hand, Precious Lord.” Tales of love, loss, regret and honor written by some of the greatest Western stars of today! We hope that you will be encouraged, challenged, inspired, and renewed as you read these short stories of people of the Old West who relied on God through the thick and thin of life and found Him faithful. You will laugh at the humorous situations that crop up in the characters’ lives. And a merry heart, as Proverbs says, is like a medicine. Other times, you will weep as you relate to their heartaches and imagine yourself walking in their boots. But most importantly, we hope as you saddle up with us and come along for the ride that you will be reminded of the powerful love our heavenly Father has for all of us. He is faithful, and you can trust Him to love you, guide you, and be with you all of your days. Enjoy as you read and look through the lens of these talented Western writers as they bring the Bible to life, wrapping spiritual stories in Western heritage.